Bob since when did grown up and billy farrell go together hahaha.Dont think he will ever grow up and he is a grand dad now. Any idea if Billy Farrell was a paper boy with Veronica. He would be about 64/65 now? Sixty-one would be spot on in terms of the age group at the time I'm thinking of. Maybe he just looked older. I had a closer look at those wee steps in July when I was back and wondered how we ever climbed them, but we did. I had a recurring nightmare about the slabs when I was a wee boy. At that time in the mid-1950s there were metal stanchions sticking up between a pair of slabs nearer the Saltcoats township. My nightmare was diving in between those two rather than the usual ones nearer the walk bridge to Esplanade Cottages. My eldest brother was married to Fearless' daughter, the lovely Cissie Crawford. Although we were from Ardrossan we had a few rellies in Saltcoats where dad and his dad were both born. Onyways to make a long story longer. Brother Bobby and I used to change into our swimming gear in Wee Kate Crawford's house which was the first over the bridge. 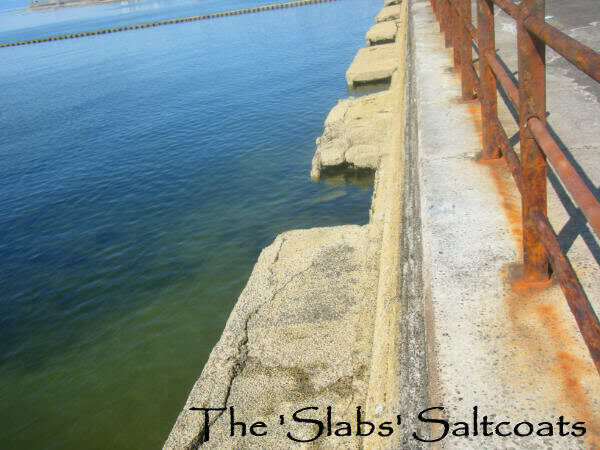 We'd go over and dive in at the slabs with the locals - used to have a few spectators, most likely they were folks going to and from Stevenston. Meg was right. The july sun in the three towns this year was just a wee bit stronger than our Winter sunshine down here in the southeast of Australia - Spring starts at the end of this month. Last edited by Hughie on Sun Nov 29, 2015 5:21 am, edited 1 time in total. Morag "really liked girls then"
I was 14 for god`s sake, girls could have had two heads, both of them with bad breath and they would still be the most wonderful creatures in the world ! BobP wrote: Morag "really liked girls then"
ach, yer just a young thing! PM? Thought that was Gordon Broon? that you see in the south coast of England, I think they were called Mulberry Harbours, also in France.